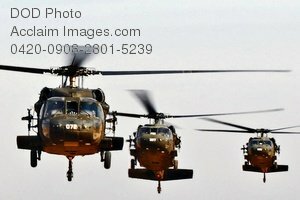 Description: Free, public domain image: Military Choppers Flying in Iraq. Helicopters from Task Force 34, 1st Battalion 244 Assault Helicopter Battalion on fly on Joint Base Balad, Iraq, March 11. 1-244 AHB consist of companies from the Louisiana and Florida National Guards. They are currently deployed to Iraq in Support of Operation Iraqi Freedom. The 1-244 AHB conducts air assault and air movement operations in support of the Multi-National Corps - Iraq as an integrated member of Task Force 34 to allow the Iraq national government to assume responsibility of the security and government of Iraq.